Why understanding the marking scheme is important. A lot of people think that the CSA is mainly testing consulting skills. They believe that if you are a nice doctor, and that you are nice to the patient and give them all they want then the trainee will succeed and get through. THIS IS NOT TRUE. Yes, the CSA tests communication skills. But the CSA also pays equal importance to testing your history and examination skills (data gathering) and your clinical management of the case. Here are the 3 things being tested…..
Data gathering is where you do your history taking and examination. You will be tested on WHAT questions you ask (i.e. asking the right set of questions). In addition you will be tested on HOW you ask (communication skills) and whether you are methodical, structured and comprehensive. diagnosis, NICE guidelines, share options, joint management plan. Clinical management means synthesising what you’ve got from Data Gathering to form a reasonable working diagnosis. It also means that you know your guidelines (e.g. NICE), share options with patients, and develop a joint management plan with them. Of course, one needs to be mindful of co-morbidity and be flexible in their approach where clinically appropriate. Interpersonal skills is about you developing rapport with the patient. It also involves showing respect for them, for their point of view and being appreciative of the psycho-social impact of a disease on their life. You should show respect for others (like family members, other health professionals) and maintain a sense of professionalism. Interpersonal skills is more than just being a nice doctor! You are basically given a mark for each area. Each area has a maximum of 3 marks. That means each case has a total of 9 marks. There are 13 cases which give a total of (13 x 9) = 117 marks. You generally need about 72-78 marks to pass – depends on how hard the cases are. A lot of people ask me how many marks do you need to pass a case. The reality is THERE IS NO MARK TO PASS A CASE. Candidates do not pass or fail cases! What determines whether you pass the CSA is the TOTAL score. You can actually get low marks in some cases and pass the CSA if you score high in others. But I realise that during practise sessions trainees do want a rough idea of how well they are doing in each case. Therefore, it seems logical to provide a rough idea of how many marks might deem your performance as satisfactory in a case. If we go for the higher pass mark of 78, this means that the average score needs to be 6 out of 9 per case. But do not forget what I said. You do not need to pass every case to pass the CSA examination as a whole (i.e. you do not need 6 in every case to pass). If you scored 5/9 in one case, but you scored 7/9 in another case, the extra mark in in the second case would make up for the deficit in the first. There’s another thing to remember – even if you did badly on one case, you are still likely to get about 3 marks for it (unless you were really really really bad). Let’s say one case went bad and you only get 3 marks for it – then you’ll only need an extra one mark in 3 of the other cases (i.e. 7/9) to make up for the deficit in that bad case. So, what I am trying to say is that if a case goes really badly – pick yourself back up. Not all is lost. You can easily make up for it. Failure only happens if you don’t get back up again. So chin up! Reset yourself and carry on with a positive mindset of passing. Give yourself a positive affirmation; something like : “I can do this. I know I can be good. And I will be good.” Positive affirmations really do work – they bring out the best in you – and there is a lot of evidence around this. By the way, there is no daily quota of how many candidates must pass or fail AND candidates are not judged against their peers. In other words, if you are good enough, you will pass even if everyone in your cohort is good enough. What does the marking sheet look like? This is an example of what the marking sheet looks like and how your results might appear. Please note, this is a made up example and the date and GMC number are fictitious. Explain the Clear Pass, Pass, Fail and Clear Fail thing.. Okay, so I said each CSA is marked out of 9. There are 3 marks for each of the three domains – Data Gathering (DG), Clinical Management (CM) and Interpersonal Skills (IS). The candidate demonstrates sound performance in the domain both in principle and in detail, operating clearly above the level for safe independent clinical practice. Performance is fluent although not necessarily sophisticated. Positive behavioural indicators of performance are consistently and proficiently met and on balance any negative behaviours observed are not thought to be of concern. The candidate's performance shows ability but overall is below the level for safe independent clinical practice. The positive behavioural indicators are not demonstrated to a consistently adequate standard and negative behaviours may be of concern. The candidate has a sound grasp of the principle of the domain more so than the detail, operating at or just above the level for safe independent clinical practice. Positive behavioural indicators are consistently met, although performance may not be fluent. On balance any negative behaviours observed are not thought to be of concern. The candidate performs well below the level for safe independent clinical practice. The range and depth of the positive indicators are poorly demonstrated and performance may be inconsistent. Negative behaviours may be of concern. “Safe independent clinical practice” indicates a level of performance that can be repeatedly delivered & reliably maintained by a doctor practising in unsupervised circumstances. 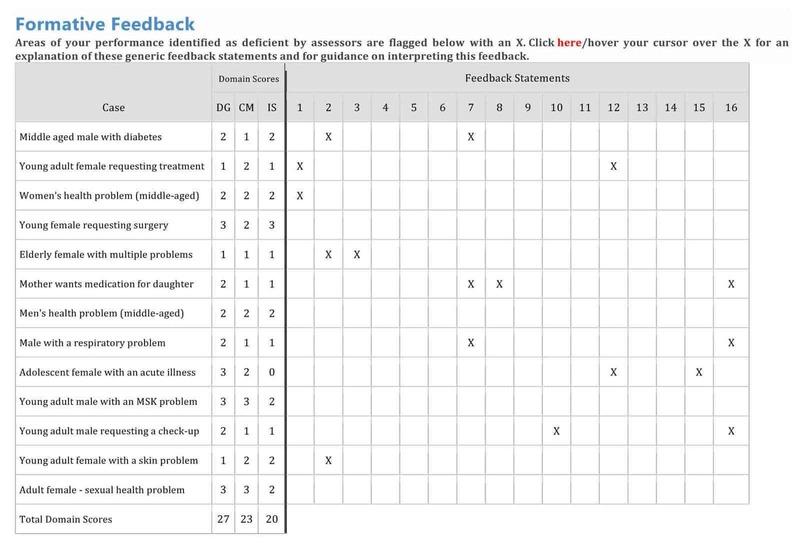 What are the 16 feedback statements in the table above? The 16 feedback statements basically outline where trainees commonly fail. So, if you get an X under any one of these for a specific case, it means you failed to demonstrate something. Swiftly read through them and you will see what I mean. 4. Does not identify abnormal findings or results or fails to recognise their implications. 9. Does not make adequate arrangements for follow-up and safety netting. 10. Does not demonstrate an awareness of management of risk or make the patient aware of relative risks of different options. 11. Does not attempt to promote good health at opportune times in the consultation. 12. Does not appear to develop rapport or show awareness of patient’s agenda, health beliefs and preferences. 14. Does not identify or use appropriate psychological or social information to place the problem in context. 15. Does not develop a shared management plan, demonstrating an ability to work in partnership with the patient. 16. Does not use language and/or explanations that are relevant and understandable to the patient. I thought you said most candidates wont get a zero? Look at 'adolescent female with an acute illness ' in the results grid above. Yes, I said most candidates will not get a zero. Most candidates who don’t do well in a case usually get about 3 marks out of a possible 9. You have to have done pretty bad to get a zero. And I did not say no one will get a zero – some candidates will unfortunately perform so badly in a case to warrant a zero in one or more of the domains. 12 – Does not appear to develop rapport or show awareness of patient’s agenda, health beliefs and preferences. 15 – Does not develop a shared management plan, demonstrating an ability to work in partnership with the patient. What do candidates fall down on? is there any research evidence for what enables an individual to pass the CSA?